Five films featuring one of the masters of horror! 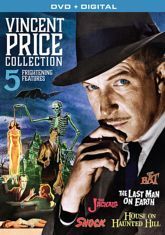 Delve into the world of Vincent Price - experience the motion pictures made by the man that made Horror a work of art! 1.) House on Haunted Hill - A wealthy man offers a hefty amount of money to five people who agree to be trapped in a haunted rental house overnight. 2.) Last Man on Earth - An illness has transformed humankind into the living dead, forcing the last man on earth to set out as a vampire hunter. 3.) Shock - After a woman witnesses a man commit murder, she is locked into a private asylum to face her psychological issues�but the one who admitted her may be the one who needs help! 4.) The Bat - A psycho killer escapes and runs loose in a mansion filled with people. 5.) The Jackals - A convicted bank robber is after a gold miner, but quickly falls in love with his granddaughter, leading to a change of plans.